First, she accidentally throws a stone statue bust clear across the room. This Disney princess does not know her own strength. She also throws a sack of hiking axes and carrots at Kristoff like it was nothing. …before pulling Kristoff up a cliff. Clearly there was plenty of time to work-out while locked in the castle. She kicks Olaf’s head high in the air in a single swing. Imagine kicking a snowball that size. It would be heavy. …and cuts through a rope strong enough to hold two people with a single swipe of a small knife. ‘Always carry a knife’ is the Disney princess motto. She punches a man so hard he flies through the air. Anna sends him flying like a rag doll. We all knew Anna was a Disney princess not to be messed with but can these really be the actions of a regular human girl? What if the King and Queen were so busy keeping Elsa’s powers under wraps they didn’t notice they had a Norway’s Incredible Hulk on their hands? In their rush to keep Elsa’s powers hidden from the kingdom they inadvertently kept Anna’s a secret too. Only when the castle gates are opened are the two princesses’ powers finally unleashed on the rest of Arendelle. The other question is whether Anna’s powers mean it’s not only the blonde princesses of the Disney universe who can develop powers? Was Anna born with this strength or does Elsa give Anna a touch of her magic when she accidentally freezes her as a child? What other Disney princesses might have superpowers? This entry was posted in The Disney Theories and tagged Disney, Frozen, Head Canons, Movies, Tangled, Theories. Bookmark the permalink. 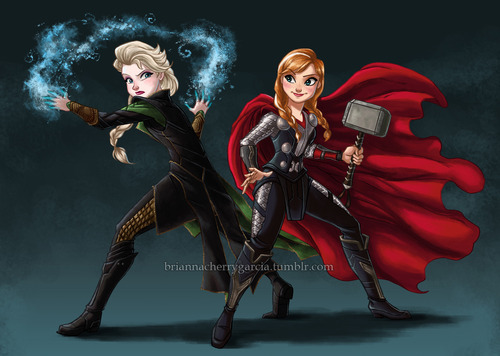 What if frozen princesses were actually distant descendant from Hercules and Meg, then would explain some of their physical attributes (Hera is blond, Elsa is blond, Hercules and Anna have the same hair color) and it would also explain their powers. While Elsa and Repunzel as a blond in the family possesses powers that are very godlike, Anna possess strange physical power, same as Hercules did, and as Hercules was she is really really clumsy which could also be one of the traits she got from her ancient great great great father. Eh, its not like the descendents of Gods’ tended to have the same powers as their parents. I mean, Disney Hercules didn’t have any marriage related powers, and I bet Hera doesn’t even lift. Hey, don’t forget, at the start of the movie, when Anna is singing “For The First Time in Forever”, she climbs out a window, sits on a swing, and pulls on a rope to lift herself up above the rooftops of the palace. She was pulling her own ENTIRE body weight like it was nothing! She is smiling in that scene! This makes a lot of sense! And the parents didn’t feel as much need to conceal Anna’s powers because they weren’t as *obvious*; she’s not *creating* stuff in the air. Ooh, someone needs to draw Anna as the Incredible Hulk. And then not only will her dress be green, but also her skin! Hehe. It’d be nice if her drawn figure could reflect her strength, though. She, like most other Disney princesses, has that delicate build. Surely it wouldn’t hurt to make her shoulders and back just a little wider? 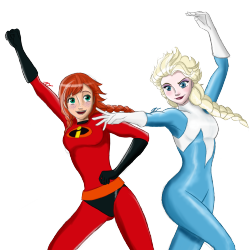 Anna is like Bob Parr, and Elsa is like Lucius Best (Frozone). This also got me thinking–if Anna and Elsa were brothers, then male!Anna would likely have a broader, stockier build than male!Elsa. You forgot to add that Anna lifter her herself as if it was so effortless to just pull a rope and a wooden board so she could see over the palace’s ceiling. Yes, you guys were pretty close, but her true powers are not strength but rather speed. Which are related, because Momentum is mass times speed. So as she can move fast she can give high momentum blows. For instance here are some that you missed. In the beginning of the film Anna is bouncing from snow pile to snow pile and Elsa says “Slow down Anna” First clue to her super speed. This speed increases her coordination, like the ability to catch the torch when Kristoff falls from the sled. Also all the above examples of her speed and finally when she rushes in to stop her sister Elsa from being struck by the sword it all happens at super speed. She is moving at super speed that one could argue her momentum broke the brittle sword. Also, keep in mind that objects at higher temperature seem to move faster, this may be just a slight clue that her super speed powers may allow her to heat things up opposite of Elsa’s powers of cooling things down. I’m pretty sure the sword breaking was due to it cooling very rapidly and becoming brittle (you can see frost on the blade if you look closely). Other than that, this makes sense. Perhaps it’s a combination of the two, as in she’s both exceptionally fast and strong. This sounds to me like a fanfic idea: Elsa, being the mage that can cast ranged ice magic (as we seen when she accidentally hit Anna, and when she held off the men of Duke Weaselton’s fierce, well organized attacks,) is pretty bad at melee attacks (as a falling chandelier of doom by Hans caused her to be knocked out.) Meanwhile Anna, despite her lack of any ranged attacks, is capable of intense melee fight (held off a pack of wolf as well as a snow golem tens of times her size.) They makes a good, fearful sword and sorceress battle duo. Maybe the The Little Mermaid has super singing powers, Rapunzal has time pausing powers/super speed thus cleaning the house in 15 minutes and doing various activities including reading 6 books, eating lunch, and talking to her mother before flynn arrived a little after 8, giving her about an hour. This is just speculation— the reason for the time disconnection might be simply movie pauses or the aura of magic around the tower. This would explain the theory of magic running in the family for blondes with elsa, and rapunzal, because although her hair healing powers came from the magic flower, she might have been born with this particular power. Also, anna did not show any signs of super strength before she was hit on the head with elsa’s powers and grew a blonde streak. It is possible that it just gets stronger by age and after a certain age in your adulthood, you either lose or learn to hide that power. It may be the case that everyone in the family has powers and have either learned to control them, or lost them. It is probable that rapuzals power is instead healing or hair strength, but it is fun to speculate. Moving on… Snow white and cinderella can control small or slightly more domestic/harmless animals. Aurora was gifted with grace and beauty and (again) seems to posses the ability to befriend small animals. Tiana and Jasmine might have extraordinary determination (Tiana) and adaptability (Jasmine) or something… Jasmine is more than what she seems and isn’t afraid to do whats right. Merida has her archery and Mulan is simply awesome. Pocahontas can understand nature and posseses wisdom of many years. Maybe they all have powers (not just the ones I randomly thought up with just now)! All mermaids have lovely singing voices. Lots of Disney princesses have a thing for animals. Some actually helped the heroine achieve her happy ending. Please. This black-haired Disney Princess has a healing factor and claws. Also, if Frozen and Tangled were connected then YES! Somewhere at the end of Tangled, Flynn gets stabbed and then he cuts off Rapunzel’s hair then he died. When Rapunzel’s Golden Hair was cut off it turned brown, but then again if magical powers only runs on blonde off springs then how come Rapunzel healed Flynn even with brown hair? She cries then drops a tear on Flynn’s cheeks then something magical happened and then Flynn was revived. Super Strength the Streak in her hair? Only without absorbing ability and full flight! then where is Aurora in the blond girl area? And does Jack Frost come in this at all? I know he is Dreamworks, but how did he get his powers? Jack Frost got his powers from the man and the moon like all of the other guardians. Is Kristoff Santa; Kris Kringle?!?? Reindeer-pulling sleigh?! WHAT WHAT! The original story is from Norway too! Her super power was being able to sleep for a very long time. Remember, Elsa (and according to this theory Anna) was born with her powers; and based on the trolls’ comments, it doesn’t seem to be an unheard-of occurrence. My theory is that Elsa, at the very least, is one of the earliest examples of the Supers who would form the backbone of The Incredibles, and is in fact a distant relative of Frozone. Most Disney Villains have a scene in their movie where there is lots of green. I really wonder why. Any way, think about this. People are saying Anna might have gotten her powers when elsa struck her. What else did she get then? HER BLONDE STREAK! So technically she is blonde. Partially. So are there really other princesses with powers? I really wonder. I believe they are all talents and likes for the others. Ariel: Talented singer. Cinderella: Loves animals. Snow White: Really has no choice. She lives in a forest for Pete’s Sake! and as for Aurora: She is blonde. What is her power? Well, you could say it is singing or talking to animals, but haven’t I ruled those out already? Yes. She just doesn’t have a power. And Hello! Cinderella anyone? Isn’t she blonde? Why don’t you care? The 3 good fairies helped Phillip escape and reach Aurora right after he was captured, meaning she was only asleep for less than a day. It’s only in the original story by the Brothers Grimm that she sleeps 100 years. Don’t forget, at the start of Frozen, when Anna is singing “For the First Time in Forever”, she climbs out a window onto a swing. She then pulls herself up using a rope so she see can above the level of the rooftops of the palace. She pulls her ENTIRE body weight up, smiling as she does so!! That seems pretty powerful to me. If Anna had super strength, why wouldn’t they put her in the military, or be Elsa’s bodyguard? they didn’t see it, as fan theorists do. Will Anna have a baby in frozen fever? 1 talent most Disney Princesses have is befriending animals, but that’s just Disney magic at work. I have held this theory ever since I saw the movie. One other piece of evidence is in “First Time in Forever” when she jumps in front of the paintings and is able to hold her pose for what seems to be an unnatural amount of time. Same white streak on her hair as Ana. I think Anna does have superpowers because we’ve got all the evidence. So far her powers are: super strength, super speed. But i think (apart from Aurora) she could a bit of immortality as in “do you wanna build a snowman?” she falls of a flight of stairs and still does not look hurt and instead still singing about the fact that she needs company…. Belle from beauty and the beast and Mulan from Mulan have also been shown to be very strong. Ok we can argue Mulan is because of militairy training. Belle puts the beast after wolf scene on Philipe her horse to get him back to castle. We also see her effortlessly help a heavy beast lay down on castle roof. And when she reached to him part of time she held him up one handed. Ana does seem very strong also.